Who doesn’t love a good gallery wall? And while oversized wall art may be trending for 2018, sometimes you just need a way to display your fabulous collection of art all on one wall. To give you a few fresh ideas on this look, we’re exploring a few different takes on the gallery wall game that are just as inspiring and impactful. Read on for some ideas and tips for creating your own new and improved version of a gallery wall at home. Rather than hanging your art, try propping a few of your favorite pieces on a shelf or two, which gives your wall an eclectic, layered look. This is a especially great if you like to switch up your artwork or move pieces around on the regular. Stylist Tip: If you’re doing this over a sofa or your bed, be sure to anchor the art pieces to the wall with little nails and hooks in the back to secure them in place. Double the coverage with a gallery wall that fills out a complete corner. Try creating a display with graphic photos, paintings, and prints that hang on both walls of the corner as way to anchor a reading nook or a seating area just below. 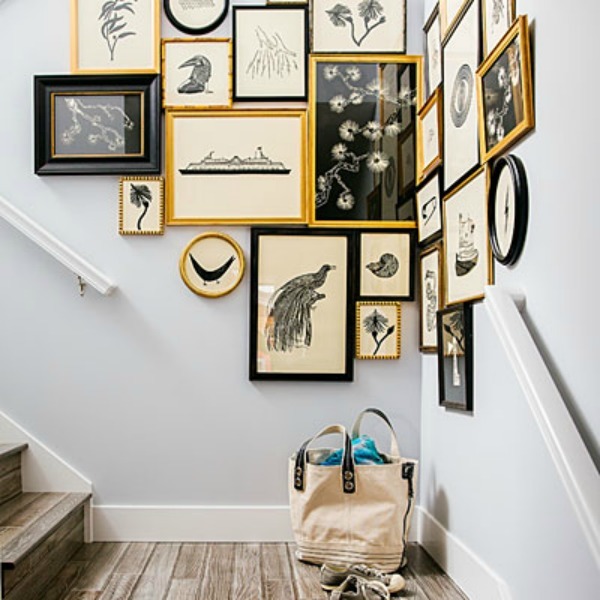 This take on the gallery wall is perfect for small and awkward corner spaces or even the base of a staircase. Stylist Tip: Don’t be afraid to go vertical and hang art high up towards the ceiling. It will add intrigue and give the illusion of height. Mix in 3D objects or sculptures for a more eclectic vibe. For a slightly more traditional take, create a grid-style gallery wall with pieces in all the same size and shape. Be it three artworks in a row or four in a grid, this is low-lift approach that guarantees a clean-lined arrangement. Stylist Tip: Pick one style frame for all your pieces to create a more consistent and cohesive look. Try using gold picture frames for all your pieces to bring unity to a gallery wall where artworks vary in sizes and subject matter. An array of gold frames will act as a common thread that ties the pieces together while also adding a little polish and shine to the overall look. Stylist Tip: The best part about an eclectic mix of frames is that you can’t go wrong. If you can’t find a consistent frame for all your art, just mix and match with gold frames in various styles. Your gallery wall will look just as bold. Usually when hanging artwork, the rule is to pick a midpoint and arrange all your art centered on that line. Break the rule: Try instead to determine a baseline and then hang all your different sized pieces in a row above that line. Stylist Tip: Place taller art in the center and then taper outwards with smaller pieces; this will help the overall composition feel more balanced. The traditional gallery wall is all about the mix, so if make sure you play around with a diverse range of artworks in all mediums. This is one instance where the more mismatched your art, the more eclectic and personal the grouping will look above your sofa, bed, or a credenza. Stylist Tip: With a gallery wall, always start with a hanging game plan. Consider the overall shape you want the pieces to form and work your way from the inside out. Next, lay your pieces out on the floor and decide where each artwork will go. If that sounds intimidating or you just want an extra set of eyes, Modsy can help create a 3D design plan for you to tweak until its right (don’t nail it until you nail it!). Need help crafting a game plan for your gallery wall? This Modsy collection is for the curator, the collector, the flea market connoisseur—that person who loves to fill their space with one-of-a-kind objects that reflect the places they’ve been and their unique tastes. The rustic wood and leather furniture blend nicely with the more eclectic accessories to add warmth and comfort to the space. Create a bold focal point in a room with a gallery wall that combines your favorite prints, paintings, sculptures, and mirrors. Have some fun playing with different color and pattern combinations! Bar carts aren’t just for booze anymore. A beautiful cart like this one can be the perfect way to showcase some of your favorite objects. Try accessorizing with a few books, lamps, candles, or succulents!